Technology at the back of cloud computing is enabling breakthrough innovation in the Global Logistics & Supply Chain industry. On the other hand blurring the boundaries between the countries have opened up the market for cross-border eCommerce thus creating a need for digitized logistics. 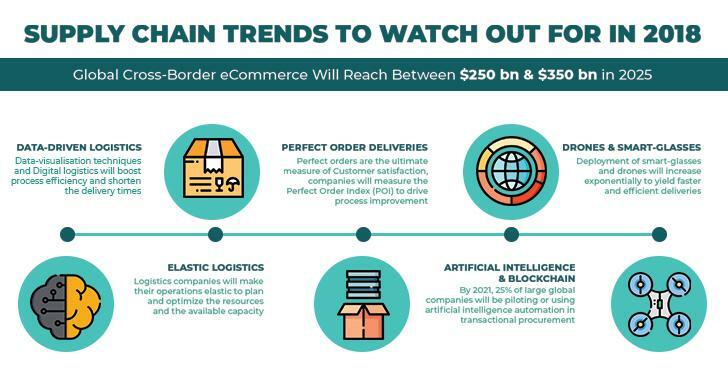 According to BCG, global cross-border eCommerce will reach between $250 billion and $350 billion in 2025, up from $80 billion in 2014, with Asia, Europe and North America accounting for 40%, 25% and 20% of the market respectively. Rising cross-border growth coupled with the advent of new-age technologies Artificial Intelligence, digitalisation and predictive analytics along with anticipatory logistics is making the logistics space exciting for 2018. It cannot be denied that logistics has become an inseparable arm of today’s businesses and enterprises across the industry verticals are mulling over ways to gain 360-degree visibility of the logistics processes, driving productivity and creating new revenue streams. CxOs across the industry verticals like eCommerce, retail, FMCG, healthcare and supply chain are aligning their strategies with the new technological advancements in order to achieve continual efficiency and deliver brand-promise ‘real-time.’ With companies around the world experimenting with the new digital technologies like AI & Blockchain, while testing the waters with drone deliveries and self-driving vehicles, Supply Chain and cross-border growth is spurred with technological progression that is aimed at improving the speed of deliveries, enhancing delivery happiness scores and perfect order scores during the time of delivery. Additionally, the aim to build sustainable final-mile solutions by reducing carbon footprints through green logistics. Together, blending the study on the technology advancements and the emerging logistics models we have summarised the way the Supply Chain and Logistics will shape up in 2018. Data remains the fundamental component of the Logistics operations and the demand for analyzing the data-patterns and turning raw operational data into actionable insights will be the future of Logistics. In the ever-changing business, staying ahead in delivering the service is the key and companies will adopt big-data algorithms, data-visualization techniques and smarter analytics to boost process efficiency and shorten the delivery times. However, the big change in 2018 will be that the companies would use geography-specific data to anticipate demand for certain products in a region and ship in advance. For instance, data can guide us if the people in New York have been searching a lot about a new book to be launched next week, it is a good idea to ship extra copies to the nearest hub and make the most of this opportunity. The complexities of last mile deliveries make the odds against fulfilling a perfect order overwhelming, and perfect orders are the ultimate measure of customer satisfaction. Perfect orders are the ultimate measure of customer satisfaction. Perfect orders are the percentage of orders delivered to the right place, with the right product, at the right time, in the right condition, in the right package, in the right quantity, with the right documentation, to the right customer, with the correct invoice. According to a recent survey conducted, only 84% of all orders can be termed as perfect orders. Achieving the perfect order mark helps in reducing cost as a wrong/imperfect shipping can lead to incurring of physical cost to fix the error (labour, replacement, refund etc), penalties and revenue loss (loss of customer and loss of sales etc). Elastic Logistics essentially means flexibility to expand and shrink capabilities to align with the demands within the supply chain model at a given time. Flexible automation solutions increase the agility and elasticity of the logistics infrastructure to cost-effectively meet market fluctuations. With optimal utilization, companies can deliver delight while keeping the costs intact, and the quest to beat the demand will be just increasing. Blockchain & Artificial Intelligence has hit the logistics industry early this year and with the security and transparency concerns, blockchain remains a suitable and secure choice for the Logistics companies for its impenetrable way to store and share the transactional data and improves credibility with a foolproof transaction. For example, if customer’s identity proof is available digitally through a blockchain based structure, there is no way it can be fudged by him at the time of delivery. Similarly, the unique blockchain enabled registration number of every bike can be mapped against the job IDs. By 2021, 25% of large global companies will be piloting or using artificial intelligence automation in transactional procurement. With the testing of Drones and Smart Glasses pacing up, automation and mobility being the support system to survive the competition, the deployment of smart-glasses and drones will increase exponentially and businesses can promise faster and efficient deliveries. Integration with smart glasses will make deliveries easier by hands-free route searches, face recognition for error-free deliveries and personalized deliveries. With the rise in unmanned aerial vehicles and smart glasses adoption, the operational efficiencies of first and last mile logistics can be increased, increased flexibility and speed of delivery in completed and congested cities. Logistics companies, globally are tying up their business and sustainability goals. According to the World Economic Forum, companies like UPS, DHL, SABMiller and Nestle are amongst the top companies that are focused on sustainability and ended up increasing revenues up to 20% while cutting down supply chain costs as much as 16%. With an objective to reduce the carbon emissions, companies are adapting to best practices that are helping them emit lighter carbon footprints by 2020. Overall, the trend is moving towards harnessing the new-age technologies for driving productivity, increasing delivery experience score and creating new revenues while banking on the huge opportunity that lies at the dawn of cross-border eCommerce while building an agile and sustainable Supply Chain in parallel. PreviousWhat Can Team India Learn From The Digital Supply Chain World? Delivering parcels is mundane! Gamification helps in keeping the rider motivated, engaged and deliver more. One of FarEye’s perks is all about getting people not only out of the office, but our mission is to help people thrive through a fit and active lifestyle. We believe in providing an improved morale, greater self-esteem and lower stress levels to our team.